Linda earned a Ph.D. in Entomology from McGill University in 1986, then moved to British Columbia, where she has worked in the production of biological controls for the provincial government to reduce and eliminate pesticide use, as head of the provincial State of Environment Reporting Unit, and as the Executive Director of the Salt Spring Island Conservancy. She now devotes her time to writing, teaching and consulting. Linda’s comprehensive gardening book, “Backyard Bounty: The Complete Guide to year-Round Organic Gardening in the Pacific Northwest”, was a BC best seller and has just been republished in a new, considerably expanded edition. She continues to self-publish books for local gardeners, most recently “Resilient Gardens”, “Pollinator Gardens”, “Garlic Diseases”, and “Pest Update”. government and organic gardening books for Rodale Press. Dr. Richard Hebda is Curator Emeritus (Botany and Earth History) at the Royal British Columbia Museum after 38 years of service, and remains adjunct faculty at the University of Victoria for 34 years. He curated the Climate and Climate Change exhibit at the museum and was the first faculty coordinator of the Restoration of Natural Systems Program at University of Victoria. He studies vegetation and climate history of BC, climate change and its impacts, ecology and origins of alpine ecosystems and botany of grasses. Ron Long had a thirty-six-year career as the sciences photographer at Simon Fraser University. As a result he has a great deal of biology in his background. 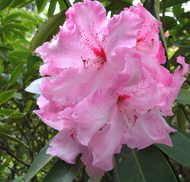 Early on Ron developed an interest in BC native plants and he has been photographing wildflowers for over forty years. Arctic/alpine species have always been of special interest to him.